This is the fourth in a series of posts about keywords for your blog. In the first post, Keywords for Your Blog- A Realistic Approach, I talked about how keywords are important for bloggers, but they are not the end-all that they are for niche marketers. Bloggers provide useful information to a niche group. Niche marketers hammer a few pages with backlinks to rank on a very few keywords. In the second post, I talked about Keywords for Your Blog – Create a Massive List of potential keywords. The third post showed you how to use the FREE section in Market Samurai to take the massive list of Keywords for Your Blog and Pare it Down Now we are going start to analyze the list to look at competition and find keywords that you can use. We are going to look at which of these keywords are actually useful. In the last post on Keywords, we looked at paring the massive list down to something more reasonable. We are down to about 1,400 and this would be nice IF we could compete for all of these. Unfortunately, that isn’t the case. Today we are going to look at analyzing your key words to see which ones have low enough competition as to be worth my time. As I noted in a previous TEACHING TIP, the Google Adwords Keywords tool talks about competition with other person bidding to advertise. Here we are interested in competing to rank on page one of a Google Search. These are not the same thing. The section of Market Samurai that we are going to use today is NOT free after the 12 day trial. STEP 1. Open your saved CSV file in Excel and add a blank column. Click on the A1 – it contains the word “Keyword”, right click –> Insert –> column) The B column is where I’m going to write notes about the results for each keyword I choose to look at. We ended the last post looking at a screen that looks like this. We are going to pick key word that we would like to write about and double click on the key beside that word. (I found that I needed to be firm to get the double click to work. It didn’t always happen the first time.) Once the key turns yellow you will see a spinner and after a few seconds the screen will look like this. There is a new tab at the top of the screen and several options. We want to use the SEO Competition option. As I said, this option is available for 12 days and then you have to pay for it. Click on the SEO Competition/Trial button and you will see this screen. TEACHING TIP: This process is time consuming in that there are 10 and 20 second pauses while Market Samurai collects data. I find myself checking Facebook or Email and then coming back. Sometimes in that process the tab I thought would be highlighted isn’t the active one when I get back. Be sure to check before you press Generate Results. 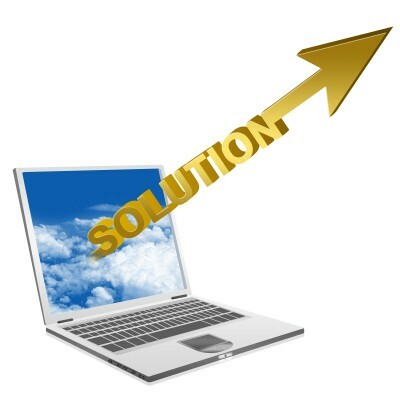 If you hover your mouse over the headers, the system will pop up a screen that describes the data contained in each one. RED shaded boxes are very hard to compete against. Yellow shaded boxes show areas where you might have a chance (with some serious work). Green is good. We can see that the next to last entry (#9) has a Page Rank of 3 and 16 Backlinks – the second highest on the page. Several Page Rank 0 sites with no backlinks at all rank above it. Obviously there is a whole lot more to the formulas than just Page Rank and backlinks. The Index Count (IC) column shows how many pages Google found on the site. Click on the little arrow beside the IC count and Market Samurai will open all of the pages listed. This would give you an idea for what your competition is talking about on their sites. You can see that some of the sites are on YouTube and get a little credit for all 2.7 billion pages that YouTube has. Obviously the vast majority have nothing to do with our keywords. 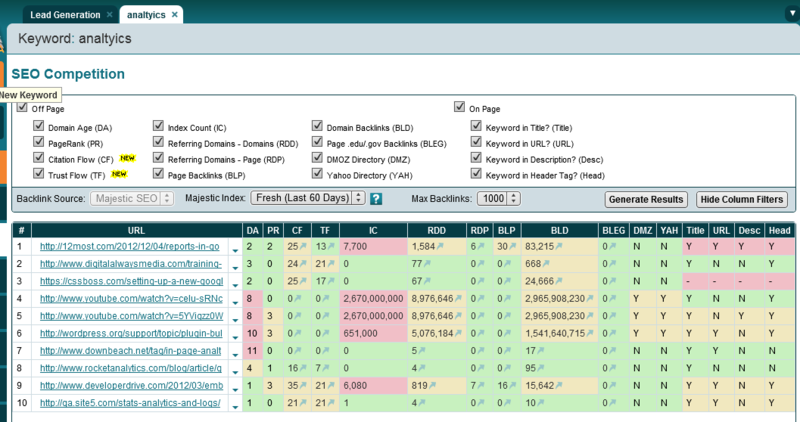 The BLD column shows the number of backlinks to the whole URL/Domain. The higher this number, the more content the site has that other people like enough to link to it. The BLEG column shows the number of backlinks from Education and Government sites. This used to be very important. It is less so now, BUT these sites often have a high Page Rank and therefore they are worth more than junk sites with a Page Rank of zero. THE DMZ column indicates whether or not the page is listed in the DMOZ site. This is the largest human reviewed site in the world. THE DMY column indicates if the page is in the Yahoo directory. This is a paid site and costs about $300 per year. The rest of the columns (not shown) are ON-PAGE factors and you can influence them. Are the keywords in the title, the domain, and the description of the pages. Are the keywords in H1, H2 and H# headers on the page, etc. There is also a column that indicates how long it has been since the Google Robot crawled the website to collect data about it. Market Samurai training suggests looking at Page Rank, Backlinks to the Page, Yahoo Directory, In Title and In URL. NOTE: There is a nice button at the bottom of the screen “Add Custom URL” You can click on this and enter YOUR URL here. It will add your domain to the list so that you can see just how far you have to go. Go down your list and check out keyword phrases that you might like to write posts about. Then record your impression in your spreadsheet, delete the column at the top of Market Samurai, choose another keyword and try again. In my case, I found that there weren’t many keywords phrases that I could reasonably rank for. 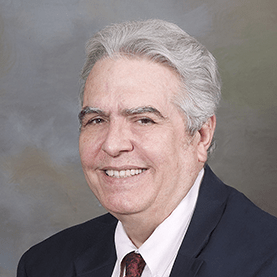 Most of the best were actually misspellings of “Google Analytics.” It amazing how many ways people can misspell “Analytics.” For example: analtyics, analtyics and analyitics. There are several Free Firefox addons that you can use to look at your competition. The two I like best are SEOQuake and SEO for Firefox. TEACHING POINT: After you get past the large sites with hundreds of thousands of searches per day, the data becomes approximate. 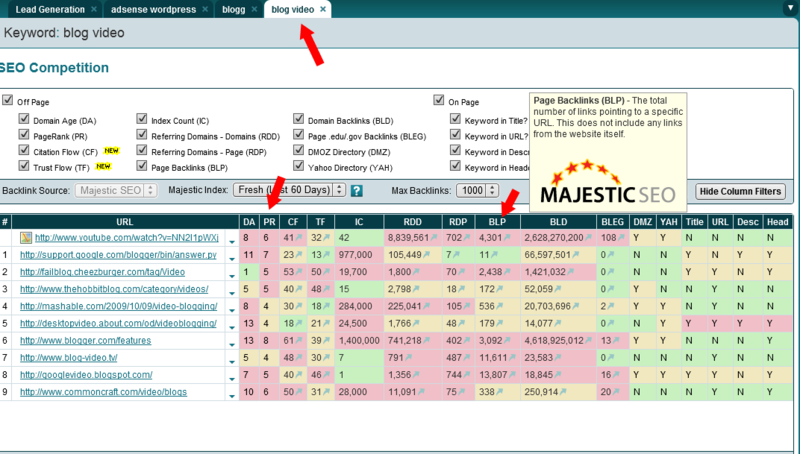 Especially in Market Samurai you will see dozens of sites that have the same daily count (e.g. 266) and then it will drop (e.g. 217) and you will see dozens more. When I got down to below 145 searches per day, I only got keywords that started with the letters P through R. You will also notice that the Google Search data reported by SEOQuakc does not match the data reported by Market Samurai for the same key word. Some of this is volatility (rankings change from day to day), but my research indicates that most of it is due to differences in the approximates used by the different tools. Just as an example, Google recently changed their rules so that it is harder to find the backlink numbers they are using, so Market Samurai uses Bing’s or Majestic’s numbers – obviously these are not the same as Google’s. There you have it – a Step-by-Step System for Finding Keywords for Your Blog and Analyzing them. Most people compare the Zune to the Touch, but after seeing how slim and surprisingly small and light it is, I consider it to be a rather unique hybrid that combines qualities of both the Touch and the Nano. It’s very colorful and lovely OLED screen is slightly smaller than the touch screen, but the player itself feels quite a bit smaller and lighter. It weighs about 2/3 as much, and is noticeably smaller in width and height, while being just a hair thicker. Please take that into account when playing the game. SimCityClubs looking to get yours is found by a club!